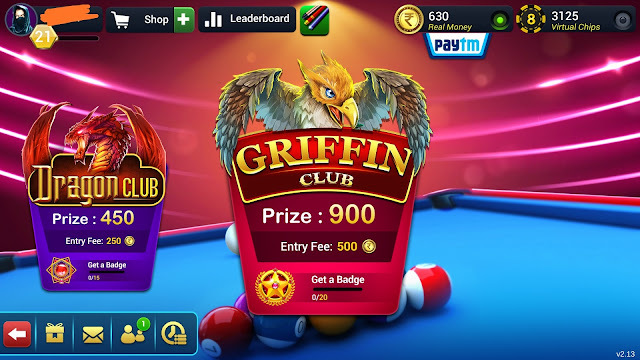 Hi, guys, I am back this time with a commercial post to help all my readers to earn unlimited money with one game app without one rupee investment. So many people are searching on the internet how to make money online without investment. Through this post, I will put stop for their searching and I will make them start earning. Are you thinking to earn money online for a long time then you will find your answer in this post. I am going to introduce one app to make money online. Are you curious to know about it very fastly!!! then why dealy just rolls down to know the complete process to earn unlimited money daily. I am going to ask you some questions below now!!!!! check answers yourselves because these answers are very important to earn through this app. Have you checked you answers yourselves then let's go into main content nothing but knowing about the app and how to earn money through it and some other important topics. Note: APP is not available on play store. I will give the link and you have to download through it. You can get the .apk file and then you have to install it to play the game. Use the above link to download the app on Android OS or Apple iOS Mobile phone. 1. After you click the above link you will see like this below image. 2. If you are an android user then click download android button or if you are Apple iOS then you can find below of the page apple ios download button. Click the whichever button you want. 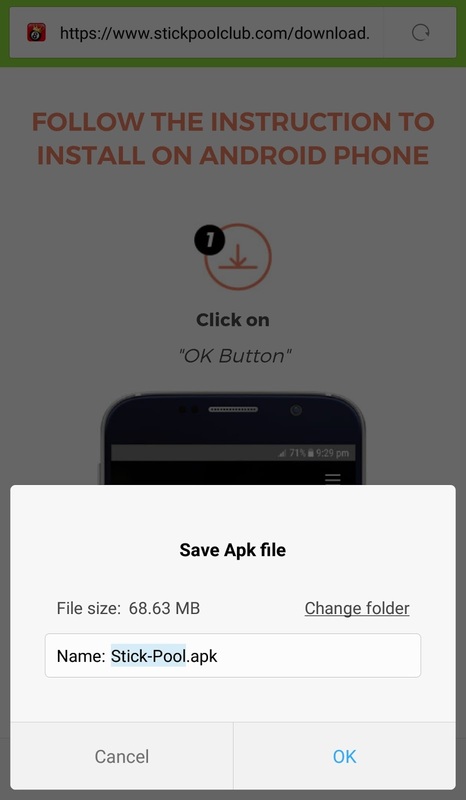 Then you will get the page asking .apk file download like below image. Download .apk file and open the app. 3. Now you have to register with Email or Facebook. Check below images how to register. 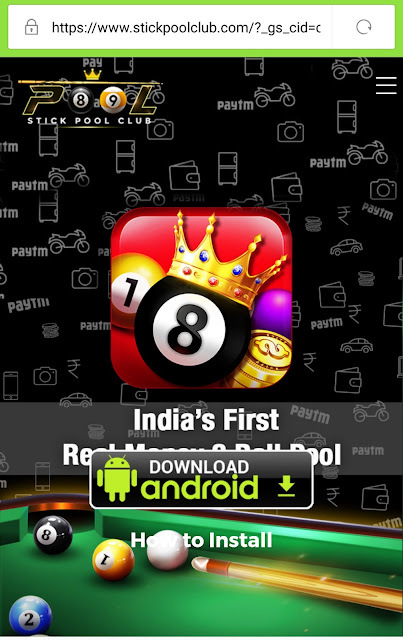 If you want to register with facebook then click on Login with Facebook or If you want to register with Email then click Login with Stick Pool Id button as shown in this below image. 4. 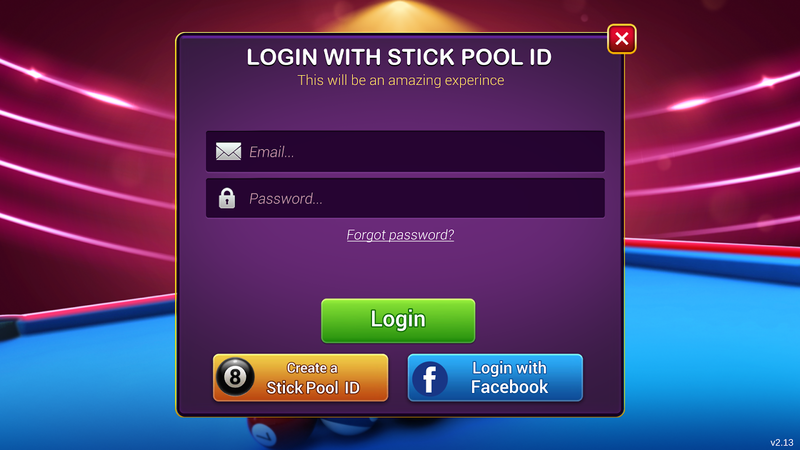 After you click Login with Stick pool Id button you will get a page like a below-shown image. 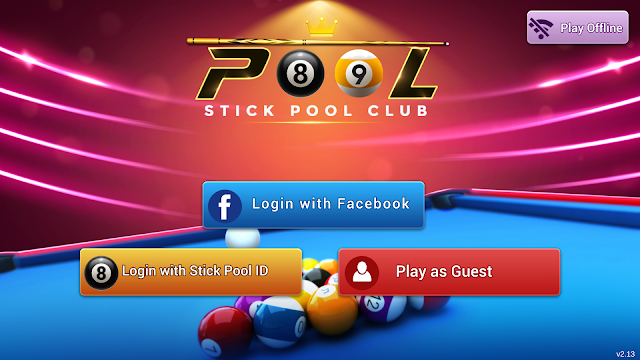 Then click create a stick pool id button to register with the email. 5. Now enter all details and register with Email like shown in the below image. 6. After you registered successfully then you will get the home page of the app like this. 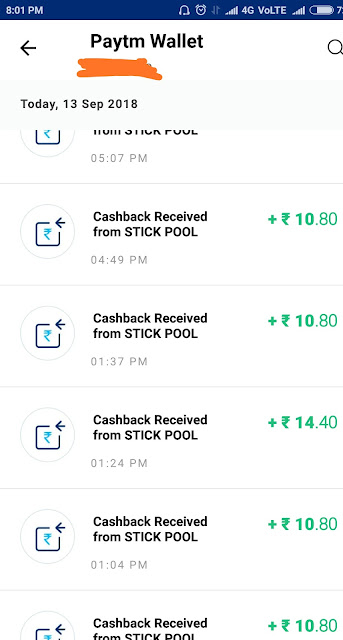 There you can see Paytm option showing below real money click it and verify with your Email and Paytm mobile number to receive money through Paytm lifelong. Now the main question is How to play!!!! Actually here two types of coins available. They are 1. Real Money: It is divided into two types again. a) Non-transferable coins: This coins can be useful for only playing games and not useful for transferring to Paytm. You can get this coins after you register successfully. 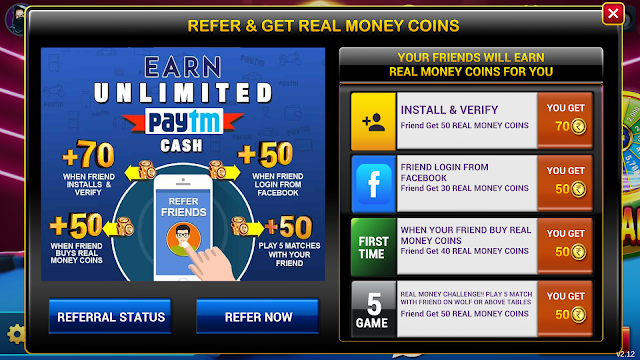 b) Transferable coins: These coins are coins which you will earn by winning the games and you can transfer them to Paytm. Minimum transfer coins are 120 that means 12 rupees but after tax deduction, you will get only 10.8 rupees. So minimum transfer rupees is 10 rupees. 2. 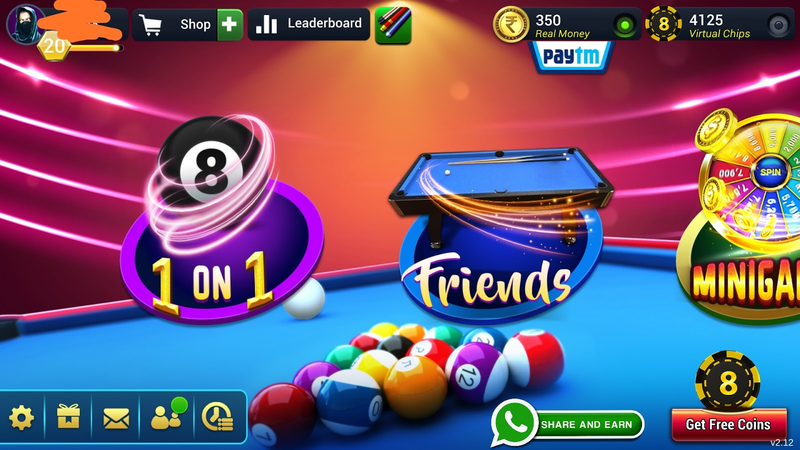 Virtual Coins: You can use this coins to practice the game before going to play with real coins and you can also use these coins to buy cues nothing but ball hitting sticks and for avatars also. You can see the coins in below image. 7. Now come to the main thing that is nothing but how to play the game with opponents.online. You can see 1 on 1 option in above image. 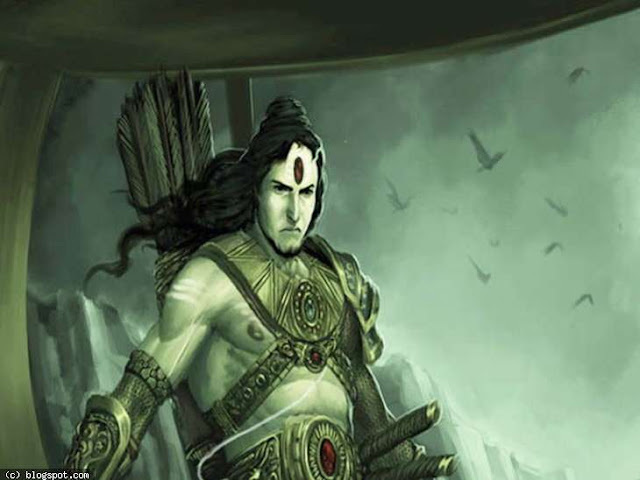 Click that then you will get modes like in below images. 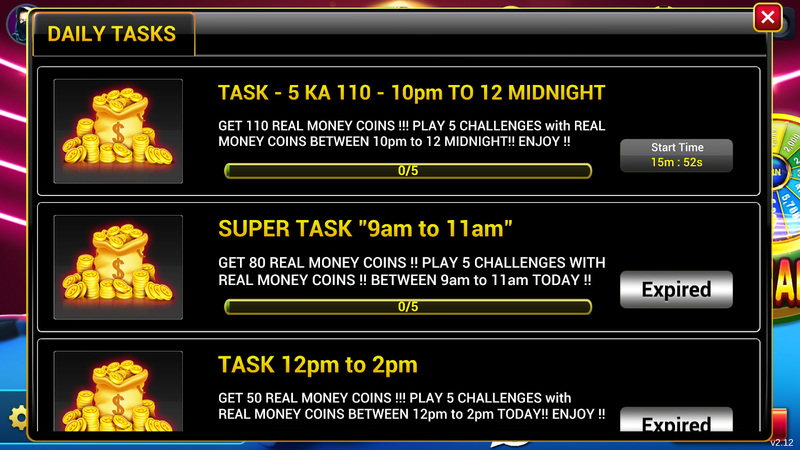 Choose whichever you want to play and earn the real coins by winning games unlimited times lifelong. 8. Not only through registration bonus, you can also get nontransferable coins daily by completing given tasks in a given time. Check below them in the image. This is all about the overall useful information about the game like how to install and how to play and how to earn real money to transfer to Paytm. 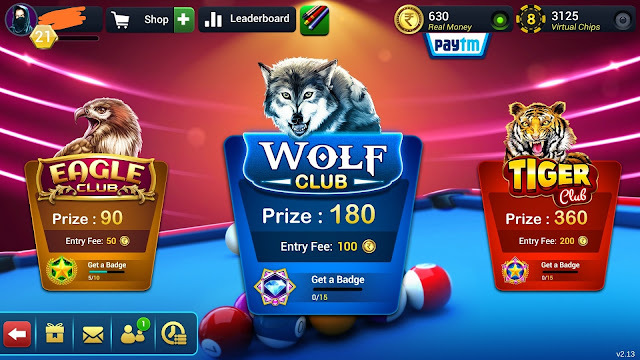 Now let me explain you my experience in the game and how I am earning so much of money through this wonderful Stick pool app. See below my profile with winnings image. My winning percentage: 74 %. This is nothing but my all-time matches winning percentage. My earned real coins: 116070. This much coins I earned and transferred nearly 5000 amount to Paytm till now. You can also easily more than If you concentrate and improve your skills in Stick pool game. My level: 20. There are levels which will increase while we are winning more and more matches. 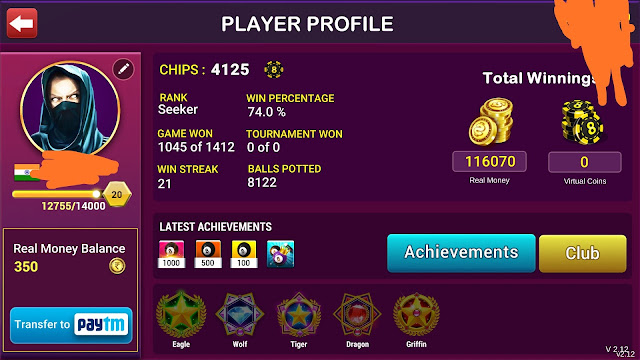 Games Won: 1045 out of 1412 matches. Winning streak: 21. You can see there my winning streak that means I continuously won 21 games in a row recently. This will come by only more practice. Balls potted: 8122. Till now I have hit 8122 balls into holes to win games. 1. Maximum chose to play with low-level players because they are not experts and not able to win games. 2. Practice more and more with virtual coins and in offline games. 3. If you lose continuously 2-3 matches in a row just stop playing app and close it and give some break because now luck is not in your side and play after sometime otherwise you will end up losing all coins continuously. 4. If you won a game with low-level players choose again to play with them by clicking I want to play again option after completion of the match. So finally what I am saying is this gaming app is a great opportunity for all people to earn unlimited money life long because earning money by playing the game is nothing but entertainment along with money. So concentrate and win as much as you can that depends on your patience. I wish you good luck to get success in this app. I will be happier if you were succeeded. If you have any doubts regarding installation or about how to play the game or any other things please comment in below comment section I will give you reply and help you.